Two foods you’ll usually find in my kitchen; frozen cheese tortellini in the freezer and cans of pizza sauce in the cupboard. I keep the tortellini for those days when life is extra crazy. With it, a quick meal can be whipped up without having to hit the drive-through. The pizza sauce is more for weekends. I love making pizza! I find the whole process very relaxing! 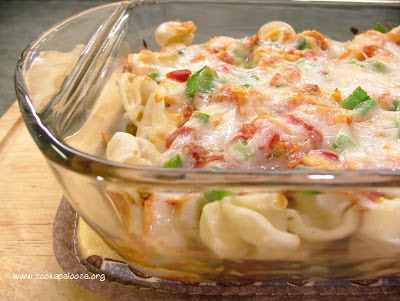 The recipe I have for you today combines both these ingredients in a baked pasta dish that smells like pizza and has that familiar pizza-pie flavor when you bite in! I should also mention...it's a cinch to make! 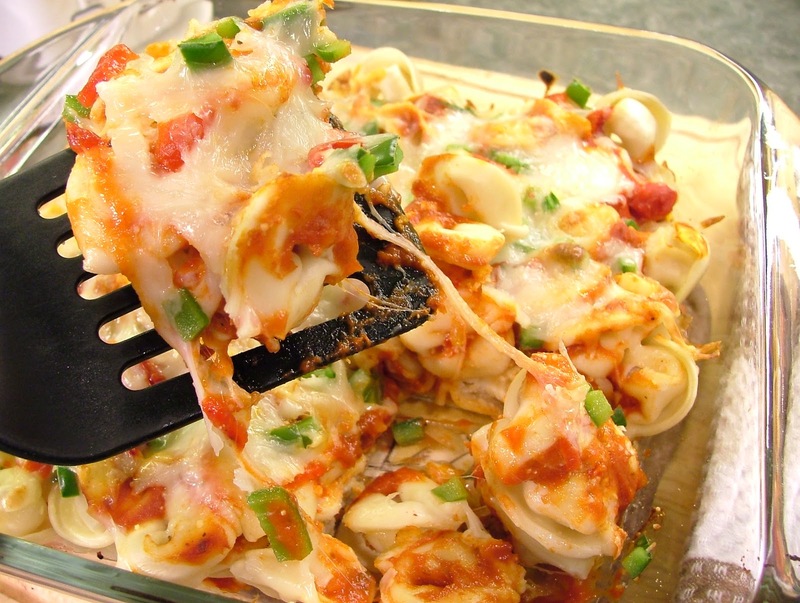 Tortellini and peppers in a pizza flavored pasta bake. In a large pot, cook tortellini according to package directions. Reserve 1/4 cup of cooking water. Mix the pizza sauce with cooking water. Spread 2 spoonfuls of sauce over the bottom of an 8x8 baking dish. Evenly spread half the cooked tortellini along the bottom of the dish. Spread half the pizza sauce on top of tortellini and evenly sprinkle on half the Parmesan cheese. Top with half the chopped green bell pepper and half the roasted red peppers. Sprinkle half the cheese on top. Repeat the process with the remaining pasta, pizza sauce, Parmesan cheese, peppers and cheese. Bake in a 425 F oven for 10 minutes. Set to broil for the last 2 minutes to lightly brown the cheese on top.